Retired Navy SEAL Captain John Doolittle is shown holding a Japanese sword owned by KAATSU inventor Dr. Yoshiaki Sato at the headquarters of KAATSU Japan in Fuchu just outside of Tokyo. The unique sword is made from a meteorite that had fallen in Japan. 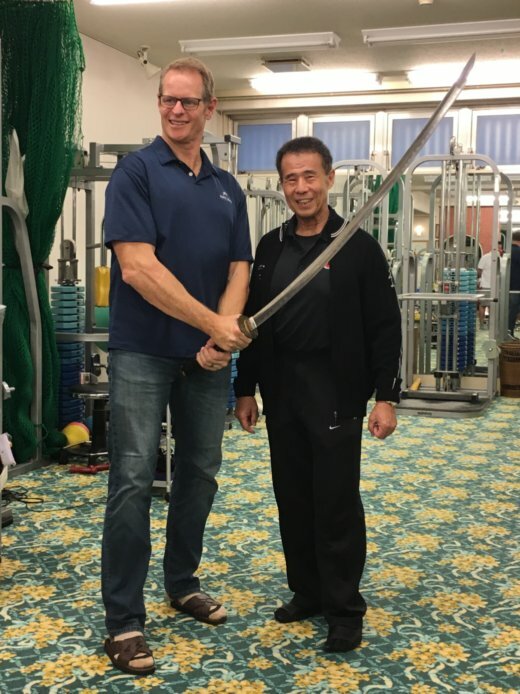 Dr. Sato acquired the raw meteorite years ago and commissioned one of Japan's most renowned sword makers to create an otherworldly long bladed weapon. The sword is so strong that it was tested by cutting cleanly through the chassis of a motor vehicle. The unique vision of Dr. Sato - whether it comes to KAATSU or a sword made from a meteorite - is always a pleasure to behold.